Looking back towards the huts of Yakwach cattle camp on the Sobat River, with Evans-Pritchard's tent pitched close to the rear of a homestead. A smaller tent can be seen further away to the left, possibly used by Evans-Pritchard's cook or other personal servant. Note on print reverse ms pencil - "43 6 A101" & print front border ms ink - "NUER "
Morton, Chris. 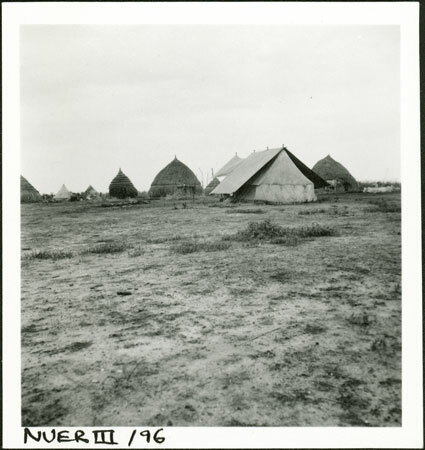 "Evans-Pritchard's tent in Nuer village" Southern Sudan Project (in development). 03 Jan. 2006. Pitt Rivers Museum. <http://southernsudan.prm.ox.ac.uk/details/1998.355.146.2/>.